“Conquest of the Planet of the Apes” was the fourth of the five original “Apes” movies, all produced by Arthur P. Jacobs. Set in a dystopian 1991, the movie, which was released in 1972, was partially shot at UC Irvine and at Century City in Los Angeles, taking advantage of the futuristic architecture of both places. Among the UC Irvine buildings we noticed in the trailer are Social Science Laboratory, neighboring Social Science Tower, and Langson Library. California’s aerospace industry was booming when fledging UC Irvine unveiled its utopian designs of high-tech architecture in the middle of a beautiful natural landscape. The buildings’ space-age look attracted the filmmakers of 1972’s “Conquest of the Planet of the Apes,” which was partially shot at UC Irvine. These are some of the details throughout the original campus that capture that sense of a new world rocketing into the future. The balustrades along the balconies of the original buildings balance floating handrails on top of tapered walls, like the gears of some futuristic engine. Light standards throughout campus are slender midcentury beacons. “Standing” on tippy-toes, Schneiderman Hall looks like a colonnade of rocket ships about to blast off in unison. The facade has sculpted lines that change from vertical columns into horizontal sunshades. While each original building featured sunscreens, each department complex had its own distinctive shape. Langson Library and the Gateway Study Center have slender vertical fins, connected by looping visors at the top. Krieger Hall and neighboring Humanities Hall have complex multicurvature panels. Steinhaus and Rowland Halls—both of which have been altered—had angular panels that looked like giant tuning forks. Tunnels have been built since ancient times, but not with the ultramodern flair of UC Irvine’s tunnels and bridges. The lively curvilinear benches of Founders Court blend a thrusting energy with a moment of repose in nature. 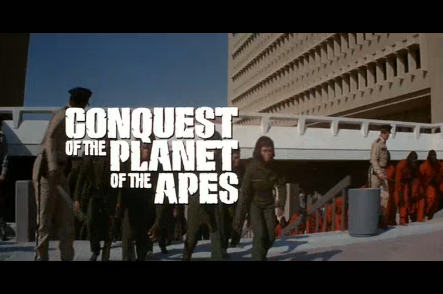 You can see more “Conquest of the Planet of the Apes” clips here.